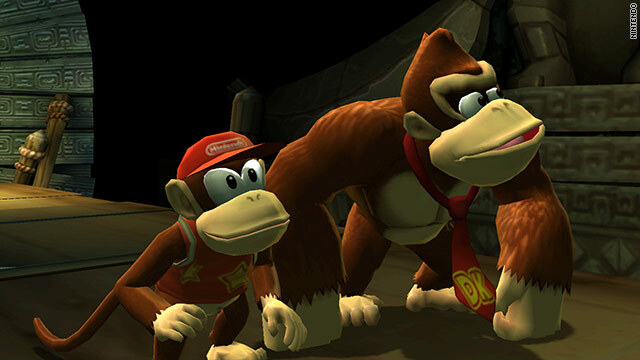 No more monkey business: Nintendo wants to trademark the pop-culture phrase "It's on like 'Donkey Kong'." Nintendo is seeking a trademark for the phrase, "It's on like Donkey Kong"
(CNN) -- Think it's "on like Donkey Kong?" Better make sure Nintendo agrees with you. The makers of the classic video-game franchise have filed a request with the U.S. Patent and Trademark office to trademark the pop-culture phrase, "It's on like 'Donkey Kong.' "
Nintendo claims that the catchphrase "is an old, popular Nintendo phrase that has a number of possible interpretations depending on how it's used." "In addition to Nintendo's use, it has been used in popular music, television and film over the years, pointing to Donkey Kong's status as an enduring pop-culture icon and video game superstar," they said Wednesday in a written release. We tend to use it when something big is about to go down. Or when we're trying to save a princess by jumping over a bunch of barrels. Whichever. Urban Dictionary defines it as "A phrase to denote that it's time to throw down or compete at a high level." The phrase has popped up in music (Urban Dictionary says a song by rapper Ice Cube may have been its first pop-culture appearance) and movies, including 2003's "American Wedding," a sequel to "American Pie." And it's clearly no coincidence that Nintendo's request comes just days before the latest Donkey Kong adventure, "Donkey Kong Country Returns," is to be released on November 21. "On Nov. 21, It's on like Donkey Kong!" reads a company press release. To be sure, Donkey Kong is one of the most iconic and enduring video-game characters ever. The original 1981 arcade game gave rise to a slew of follow-ups, like "Donkey Kong Country" for the Nintendo Super NES, and the equally popular series of games featuring Mario, Donkey Kong's mustachioed nemesis. Donkey Kong is a huge, "King Kong" like gorilla who spitefully kidnaps plumber Mario's girlfriend in the original game. His name came when the Japanese company wanted to show how stubborn he was. (Mario, incidentally, is reportedly named for the landlord of the Nintendo of America building). More than 25 years after its release, the game also was the focus of "The King of Kong," a 2007 documentary about two colorful players vying for the world record score on the classic arcade game. What do you think? Does Nintendo have a case? Is it just a publicity stunt? And do you plan to play the new game?